Dan Abnett takes over the writing from Scott Benson and Len Kaminski. Dave Chlystek takes over the pencilling for this 3-part story. All but #1 of this series doesn't list an Editor-In-Chief. 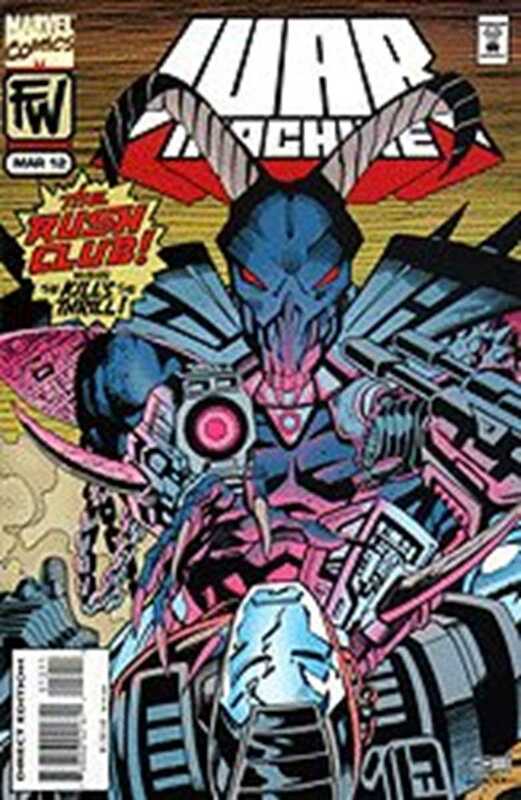 In line with the issues of Iron Man and Force Works Tom DeFalco was probably EIC up to last issue. From this point there was no EIC. Instead Marvel Comics was divided into groups of titles each with an Executive Editor. In this month's issue of IM and FW Mark Gruenwald starts appearing as the Exec of the Avengers and Cosmic group. In this title he's given humorous credits. Our site doesn't have an Executive Editor entry so from this issue I will include Mark as EIC. The foe on the cover is Quarry. Despite the FW logo branding this title, Iron Man and Force Works being a close family, the common editorship by Nel Yomtov and now the Exec Editorship of Gruenwald, there's time confusion between this issue, the last, the next and FW#8. Last issue, which included a pre-Christmas party, Jim and Rae decided to visit Jim's family for the New Year. FW#8 has Jim leaving a message for Tony Stark apologising for not being able to attend the FW Christmas Night party because he's on the way East. This issue has him setting out for Philly during the day, and the Marvel Chronology Project has him leaving the message during the journey. The battle in this issue takes place over that night, but next issue will say it's New Year's Eve. This is the 1st appearance of Mr Rhodes. Mrs Rhodes we met before in Iron Man #173. They will be named David and Roberta in Secret War: From The Files Of Nick Fury, but the father will be called Terrence in Rhodey's later Iron Patriot series. Mr Rhodes will have a cameo next issue. Mrs Rhodes will turn up next in War Machine vol 2 without him. And then *he*'ll turn up without her in the Iron Patriot series. British scribe Dan Abnett has probably named Locomotive Breath after a song by Jethro Tull. He and the other 3 armoured chars are invented for this story. A guy referred to as Loco shows a hologram simulation of Quarry, the latest armour he has designed, to Aaron and Carson. Apparently it is to be used by someone who has agreed to be hunted by them. Carson is enthusiastic about the sport this new armour will provide, Aaron less so. Loco isn't happy that this hunt will be near a city, but the candidate insists on the venue and Carson thinks he'll be worth it. He's Owen Segar who used to be a Navy pilot and SEAL but is now living in a Vets' shelter. Aaron just hopes he'll give them a better chase than most previous candidates, which Carson says is exactly the point. James Rhodes is flying his War Machine armour over Los Angeles, exhilarating in the improvements Tony Stark has made since they regained their friendship after the Hands Of The Mandarin crossover. Now he heads off to see his parents in Philadelphia for the New Year. And girlfriend Rae LaCoste will be joining them by plane tomorrow. Worldwatch will have to manage without him. In the Worldwatch offices Ranald Jeffries welcomes their newest member Archie Park. Rhodey recruited him last issue from Stark Enterprises to maintain the War Machine armour. Archie doesn't know that JR and WM are the same person, and Jim only confessed to the rest of the team last issue. Meanwhile Sheva Joseph is setting off on a mission to Santiago, Chile to investigate reported human rights violations. Rhodes arrives in Philly, hires a car and packs away his armour before approaching his suburban family home. He gets a frosty reception when he mentions Rae. They think he could do better, even though they've never met her. At 1st it seems they disapprove of her being a beautician, even though she actually runs a chain of stores in LA. But then it becomes clear it's because she's white. Jim leaves in a huff and drives around town. He finds his High School boarded up, but Otis is still around to sell him a coke, and Marilyn to serve him a burger. She directs him to the Vets' shelter where he'll find an old army buddy Joe Barnes. And Joe tells him how another pal Owen Segar had 2 weeks ago gone off with Carson Rowntree, who Rhodey has less fond memories of and who has seemingly done well for himself. Owen Segar is now in an abandoned industrial site in Penn's Landing, Philadelphia on the banks of the Delaware. He's wearing the Quarry suit and facing Rowntree in his Gunship armour. They fight for a while and Quarry is losing until he unleashes a mighty blast and then flies away. He messages back that he only agreed to this in order to get the Quarry armour, and now he's taking it. Rowntree calls in the other 2 as they chase Segar into the city. Jim Rhodes has booked into a motel in Center City, the heart of Philly, remembering how Carson Rowntree was a thorn in his side through High School and then into the Marines. Then an alarm in his stored armour signals trouble reported on the police waveband. Outside Gunship knocks Quarry out of the sky into the night-life of Philly's city centre. Loco tries to abort the game and call Rowntree off because of the danger to civilians, but Gunship won't quit. Quarry gets up and back into the air but it's War Machine who knocks him down again. So Gunship attacks *him*, figuring he'll put up a better fight. WM fires off some of the bigger guns Stark has equipped him with, and then crushes part of Gunship's armour before tossing him to the ground. Then Rhodes turns his attention to Quarry, who is confused by the current developments. Another interlude. Rae LaCoste caught an earlier flight and turns up at the Rhodes' doorstep the night before she was supposed to get there. She gets a stony-faced reception. War Machine rips off Quarry's mask and adds to Segar's confusion by recognising him. But they are both attacked by all 3 members of the Rush Club (so-named because of the adrenaline rush they get during the chase). Loco occupies giant armour under the name Locomotive Breath. And armoured Aaron has claws and a crossbow as Sanction. Archie Park, Gunship, Locomotive Breath, Quarry, Rae LaCoste, Ranald Jeffries, Sanction, Sheva Joseph, War Machine (James Rhodes).